Halloween Tips: Pet Safety Tips For This Halloween! Halloween is just around the corner and although it is a very fun and festive time of the year, it is also one of the spookiest nights of the year! It is important to keep safety in mind when it comes to your dog or cat. Here are some simple steps to take to ensure you and your family have a safe and fun Halloween along side your pets! 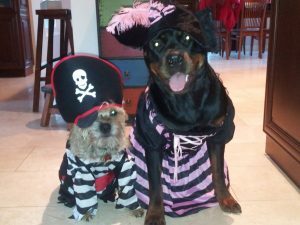 Limiting Movement or Senses – Your Pet’s costume should be comfortable for them and not restrict their eating, drinking, eliminating, or barking. Avoid masks or anything that covers eyes or parts of the face as this will limit your pet’s senses. Make sure that there aren’t any loose or dangling pieces that could tangle in your pet’s legs and cause your pet to trip! Choking Hazards – Check your pet’s costume for any parts that your pet may be tempted to chew on! If there are either remove these parts or securely attach to the rest of the costume. Items around your pet’s neck including bow ties, scarves, or ribbons can cause problems if they become stuck or tangled. Wear Bright Colors – If you plan on dressing your pet on Halloween, try to select a brightly colored costume so people can see your pet easily. This is especially important if your pet is going trick- or treating with you! Stay Comfortable – It’s important that your pet remains comfortable and relaxed at all times while wearing a costume. 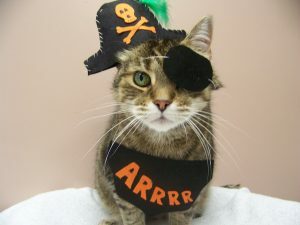 If you notice that a part of the costume is bothering your pet, remove that part or the entire costume if necessary. If your pet seems distressed, allergic or shows abnormal behavior, consider letting him go au natural or donning a festive bandana. Halloween decorations can range from a simple pumpkin to an entire yard filled with ‘scary’ fun. While carving the pumpkin be sure to have your pet in a safe place, away from the pumpkin carving area. Nothing says Halloween like a carved pumpkin lit on your front porch, but be careful not to let your pet near the open flame! Pets can easily knock a lit pumpkin over and cause a fire. Curious kittens especially run the risk of getting burned or singed by candle flames. If you have young pets at home be sure to keep any extension cords well out of the way! Although you love to share every aspect of the holiday with your pet, it is best to leave them at home during your trick- or-treat run. Your dog may become spooked and run away, or may eat something off the street in the dark. Be sure to keep your cats inside on Halloweens as unfortunately cats, especially black cats, are often the target of Halloween night pranks. Keep your pets safe and sound inside your home for Halloween so you can enjoy your trick-or –treating! Scared or Nervous Pets Does a ringing doorbell stress your pet? New people at the door? If you are unsure how your pet will respond to multiple trick-or-treaters, or if you know your pet’s anxiety and stress level will increase, you should make appropriate preparations to reduce your pet’s discomfort as much as possible. Create a safe place your pet is comfortable in, this may in a living room or in a bedroom, having the television or radio on can block some of the noises. Make sure your pet has access to fresh water, and a litterbox (if appropriate). A tasty long lasting rawhide may be warranted as a treat! Be sure to take your dog for a long walk, or have an extended play session with your cat to ensure they are tired before the evening and to ensure you will not have to take them outside during the trick- or treating to eliminate. Depending on the level of your pet’s stress and anxiety, you may want to consider giving your pet a mild sedative. Speak with your veterinarian before the big day about possible safe sedatives for your pets. When the last trick-or-treater has left, be sure to give your pet lots of snuggles and affection. 4) Finally Done for the Night, Can I Share? Although you may be tempted to share a piece of you Halloween taking with your pet after a long night, stick with giving your pet one of their regular treats! Be sure to keep your pets from getting into your Halloween candy stash! Here are some things to especially watch for! Chocolate: Chocolate in all forms—especially dark or baking chocolate—can be very dangerous for dogs and cats. Symptoms of chocolate poisoning may include vomiting, diarrhea, rapid breathing, increased heart rate, and seizures. Candy containing xylitol, an artificial sweetener, can cause vomiting, sudden, severe drops in blood sugar, loss of coordination and seizures. Excessive amounts of sugary treats can lead to hyperactivity, increased heart rate, upset stomach, vomiting and diarrhea. 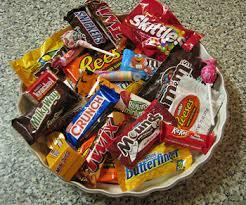 Candy wrappers can cause an upset stomach such as vomiting or diarrhea and can even cause intestinal blockages. Candy and food that contains grapes or raisins as these can cause acute kidney failure! Signs may include an increase in drinking, urinations, vomiting, and in appetence. If you do suspect your pet has ingested something toxic, please call your veterinarian or the ASPCA Animal Poison Control Center at (888) 426-4435 immediately! If you have any questions or concerns surrounding your pets’ health over the fall season, please feel free to call or stop by the clinic! HAVE SAFE AND HAPPY HOWL-O-WEEN!